The term “magical realism” was coined by the art critic Franz Roh in a founding essay of the same name, back in 1925, to refer to a new artistic movement after the avant-garde in which art regained realism, but from a subjective perspective, plagued by atmospheres and imaginary referents. However, for ordinary mortals, magical realism remains a literary trend of the mid-twentieth century, in which Latin American writers such as García Márquez and Julio Cortázar stood out; since it was in this field dono came to popularize the term. 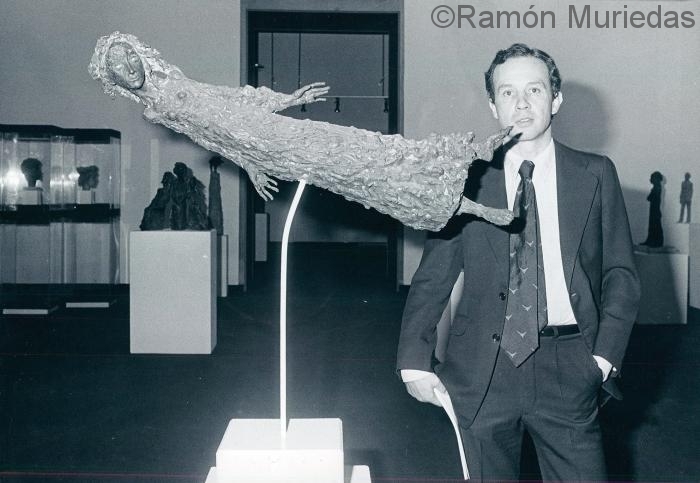 It may seem strange, therefore, to begin a text about the work of a sculptor with this heading, but this was the most commonly used qualification by different contemporaneous writers and critics to describe the work of Ramón Muriedas. A work, that by its singularity, was difficult to pigeonhole in any artistic current of the time. It is true that not only the influences cited by him, but also by those who spoke of him, placed him very close to the literary field. His enormous love for reading, and his extensive cultural background, brought him closer to the classics, to the great poets and novelists of Romanticism and to many other writers of his time. So we have a Julio Caro Baroja that identifies the characters created by Muriedas as poetic and fictional, from some narration of Chekhov; or the same artist, who speaks of his continuous readings of Rilke, Bronte, Withman or Bernandin de Saint-Pierre, which places him, as he well stated several times under the strong influence of nineteenth-century romanticism, in any of his artistic manifestations . And, to finish with the literary simile, it should be added that he intimated personally and that his work was admired by writers of the stature of José Hierro, Álvaro Pombo, Manuel Mújica Lainez, Julio Cortázar and Juan Benet. As sculptural referents of his work, highlight Henry Moore and Giacometti. The unfinished textures and stylization of the Italian artist’s figures were always present in his work, and this influence made many experts, such as Francisco Calvo Serraller or the director of the Museum of Contemporary Art in Budapest -G. Geza-, where he made an anthology in 1981, so they recognized him. The sculptor worked mostly on pieces of small and medium format. Sculptures that one can easily approach and observe from all possible angles. Returning to the parallelism with other arts, his was not the orchestral music, but the intimacy of a small and exquisite chamber group. Some figures of iron internal structure, of a careful harmonic and formal perfection, which then ended with an air “apparently” free, elusive and carefree. In his sculptures, the human figure seems to emerge from some undefined element of Nature-from an undulating brush or from the texture of eroded rocks; and, depending on how you look at it, the same figures seem, once again, to be absorbed by it in a sort of impossible balance between order and chaos. In some way, a hidden desire is intuited to show man metamorphosed by the sinuous beauty of the natural environment. It also surprises the enormous technical complexity of his sculptures, resolved with such skill that causes the most complicated artifice to look like an easy and friendly game. Modeling the clay with those airy, fine textures, sustaining itself in the air with finishes that defied gravity, made his pieces extremely fragile, but that unstable balance, gave his sculptures an ethereal, delicate and aesthetic appearance. And, speaking of balance, it must be mentioned that all of us who have ventured into the art of modeling, know how difficult it is for a seated figure to hold on without a pedestal. Muriedas knew how to balance the weights so that those firm and stylized men stood erect on simple shoes, or those beautiful women did on delicate bare feet. There is, therefore, in the work of this artist, discipline and rigor. His sculptures, apparently kind and innocent, keep quiet secrets that hide behind that absent gaze, directed towards an infinite point. Its disturbing silence, its isolation – even when they are presented as a group – and its stoic, hieratic gesture, contrasts with the movement and the present life in its clothes, hair and finishes. All the characters created by the sculptor may seem the same, but all have been consciously individualized, each of them is subject to their own reflections, alone or accompanied, are taciturn before the viewer. 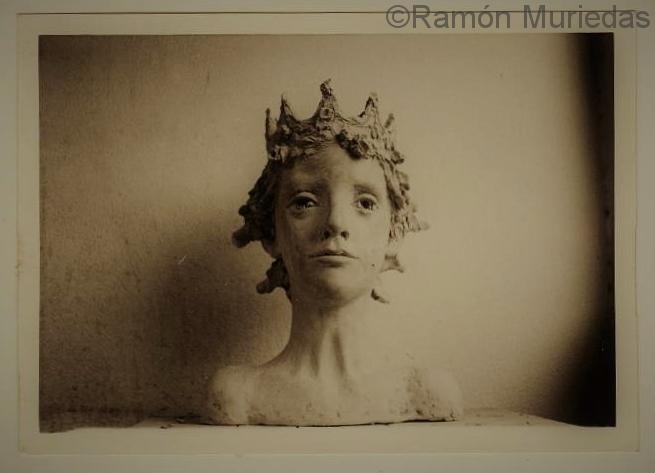 Loaded with mystery, firm and proud; delicately beautiful Perhaps for all these reasons, the figures of Ramón Muriedas provoke in all those who contemplate them a deep, strange and serene emotion.